Symposium host, Dr. Marc Branham of the University of Florida, will be hosting an afternoon canoe trip on the Santa Fe River on Friday, August 15th, following the closing of the symposium at 11:00am. Trip participants will depart from the Hilton University of Florida Conference Center at 11:30, and transportation to and from the Santa Fe River will be provided. The river is spring-fed and contains and is surrounded by wildlife and amazing scenery. 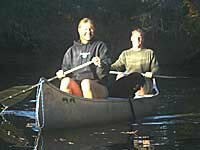 No prior canoeing experience is necessary. If you have time during your stay and have an interest in nature or canoeing, you will not want to miss this trip! Sunscreen, sunglasses, hat, water, insect repellent, shoes you don’t mind getting wet, change of dry clothes, raincoat, and towel. Snorkeling gear is recommended if you would like to swim and view the underwater flora/fauna in style!